Growing an audience online is a complicated process, especially when you are focusing on producing highly engaging content that attracts and creates a strong connection with your followers. But as online marketers, we also need to have a measurable objective that the content we put out there serves. My Facebook funnel is quite simple. I get extremely active and consistent engagement by connecting and producing content on my personal profile on Facebook. It is such an overlooked tool for building your visibility and brand authority – without resorting to salesy tactics or breaking any rules about using your personal profile for commercial gain. Here is how I do it or, as I call it, my Fearless Client Attraction Method. While I focus on connecting to the audience that resonates with my worldview on my personal profile, I often mention my Facebook group, Social Media Visibility That Gets Clients. Naturally, the name of the group speaks for itself, and this is where I drive most of my followers. And here’s a secret. I have a handy little extension called Group Funnels installed on my Chrome Browser. I ask everyone who joins my group some strategic market research questions – one of them is an offer for one of my free resources in exchange for their email address. Group Funnels tool helps me push all those answers into the Google sheet that I can integrate with my email list, so it is growing at the same time as my group. This solution, however, has one little problem. As the questions are optional, some people who apply do not leave their email, so I am losing an opportunity to add them to my list. This is when I found a solution that is helping me to not just increase the email list sign-ups, but to engage my audience in a fun, yet educational activity – TAKING A QUIZ! Quizzes are the most interactive type of content with a potential of going viral, and I always wanted to be able to use them in my social media marketing toolbox. The first step is to make sure your quiz addresses the pain point of your ideal target- since we want to only attract the best kind of audience for our service or product. “Quality over quantity” is a concept I learnt from my experience working with numerous online projects. I often see Facebook groups and pages with a large number of members or followers number actually get no interaction and very little conversions compared to smaller communities that are built with highly targeted leads who are ready and searching for the exact service/information or product the company offers. Personally, for me, my ideal client is only considering becoming more visible online. They have different reasons they think they are not able to show up fearlessly and grow their personal brand: some think they are afraid of technology, some think they are too old, some just feel extremely overwhelmed with what they think they have to do, so they do not even give it a fair try. So my quiz is best aimed at revealing the fact that they are “hiding” and the opportunities that they can discover if they follow an easy-to-implement strategy that I teach. 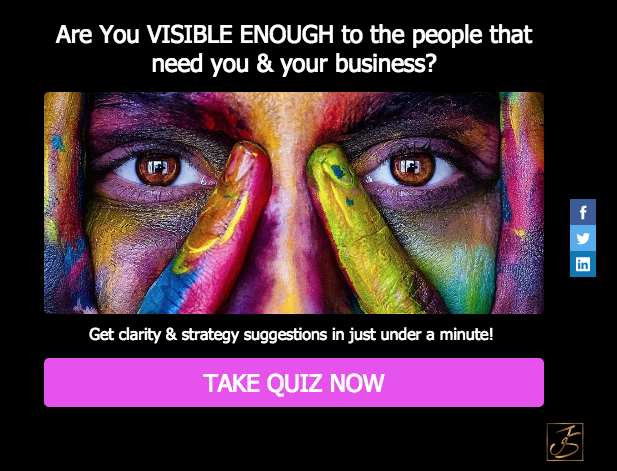 For this audience, I created a quiz called “Are You VISIBLE ENOUGH to the people that need you & your business?”. There is a particular use of the word ENOUGH, which I will get back to at the later stage in this article. The tagline promises to get clarity and strategy suggestions in just under one minute. This means it requires a minimum time commitment and will create more conversions. I strategically chose a highly visible image that in some way represents hiding – with a woman covering her face with her hands. Yet the eyes are looking straight at the viewer, telling them that she is ready to show up more! I used a selection of simple questions aimed at uncovering what they may be doing wrong- for example, not posting enough, not being consistent, not planning their content. The best way to create quality leads who are eager to find out more is to ask them about their pain points. You want to highlight some weaknesses, by having the consciously choosing the answers that confirm the problem. For example, a lot of my students start with a huge fear of doing live video. 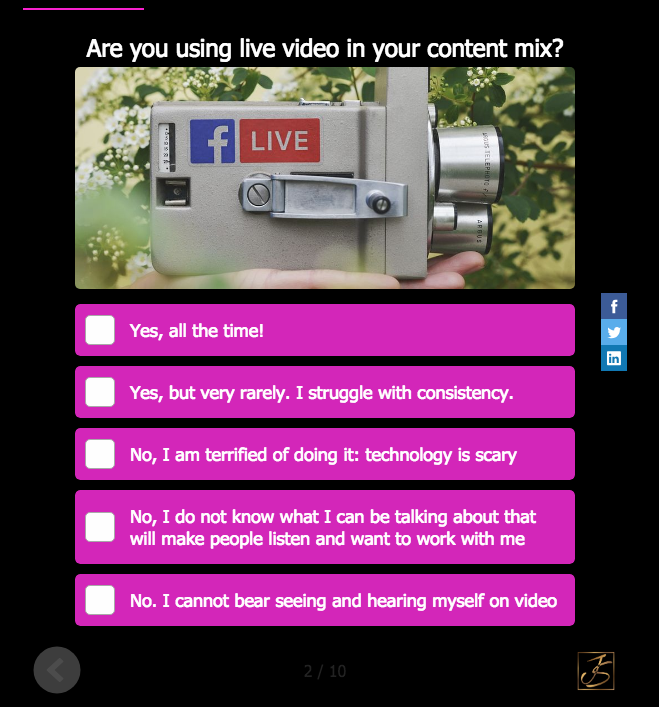 In my quiz question about using live video in their content mix, I use the wording that describes their fears in each of the answers. If you are not sure what pain points your audience has, make sure that you spend a lot of your marketing time on surveying and speaking to your clients and prospects one on one to find out more about them. Take down all specific words they use to describe their current situation as well as how they describe their ideal situation. Make sure you use these exact words when creating questions for your quiz. The results page would highlight the immediate issue that their answers would reveal and the next step is, of course, to offer them free support inside my Facebook group. I deliberately did not offer to give me their email at that stage, although Interact Quizzes have an excellent built-in tool for growing one’s list from inside the quiz. I know my audience too well. They are not very marketing-savvy. In fact, they often get annoyed at anything they may deem “too aggressive” – that includes asking them for their email address. This means some people in my audience will definitely bounce off when they are presented with an opt-in form. Since my objective is to grow my free Facebook group, Social Media Visibility that Gets Clients with good quality leads and I need to be very careful to offer my leads the best experience and start building trust in our relationships from the start. Inside the group, I focus all my attention on connecting with the new members personally via messenger, which is part of my client attraction strategy and something that helps build amazing relationships with group members! Therefore, at the bottom of every result page, I have a nice big pink button offering them a low commitment action – join a free Facebook group. The idea is to get them to say YES! As they get redirected to my Facebook group, I ask them three questions upon joining. Two of them are purely for market research, I can check what they think is their problem and then create content busting the limiting beliefs or providing a solution to this problem. As they have just said yes to my first offer to join the group, most of them say yes to a free gift and give me their email address. When I approve the new members, I use GroupFunnel to store the answers into a Google Spreadsheet and then I automatically add the email addresses to my email marketing software Active Campaign using a simple Zaper integration. Which means I get pre-qualified members joining my group after they already said yes to one of my free offers, gave me their email address, and I can add them to my email marketing software in bulk with literally three clicks. This is only one example with just one quiz. But the possibilities are endless. I can create different quizzes using the knowledge of struggles my audience have and how my solutions help them take those frustrations away. Overwhelm, lack of planning, fear of visibility, believing that they need a lot of money to invest. Each one of those pain points can be an inspiration for several quizzes. The best thing is that the people in my audience are growth hackers. They want to grow and become better, and they love finding ways to bust through their fears and push their comfort zone. And what is more attractive to reveal the solution than taking a simple quiz? Quizzes are such a powerful lead generating tool, and they can be used in so many ways to bring pre-qualified leads into the place where you have your best conversions. 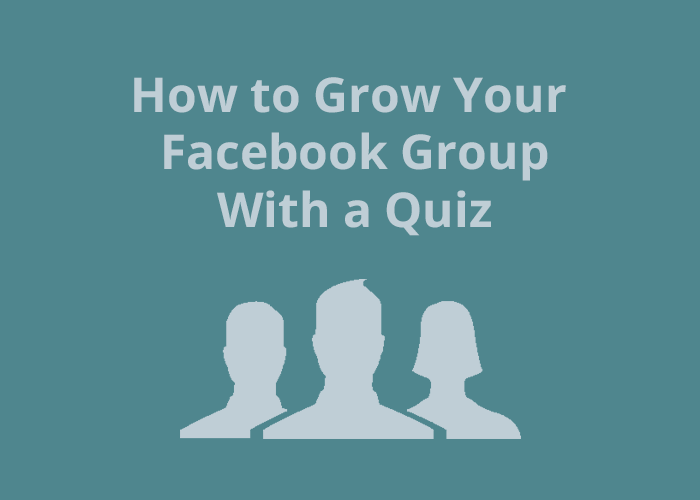 This varies depending on your business model and your funnels, but I highly recommend using quizzes for growing a Facebook group, where you can create one-on-one relationships with your audience. The relationships that do not just attract loyal clients to your business, but create raving advocates for your brand. And you can grow your email list at the same time, so your name becomes present in their lives in many different places. This omnipresence helps build strong associations with you and your brand as a constant in their lives, which means you will be there when they need you. Which means trust to bring their business to you. Are you ready to grow your Facebook group and email list at the same time? Click here to create your own quiz lead magnet now! 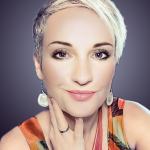 Known as The Queen Of Visibility, Juliette Stapleton is an internationally recognised Visibility Strategist with thousands of students and clients from more that 30+ countires. 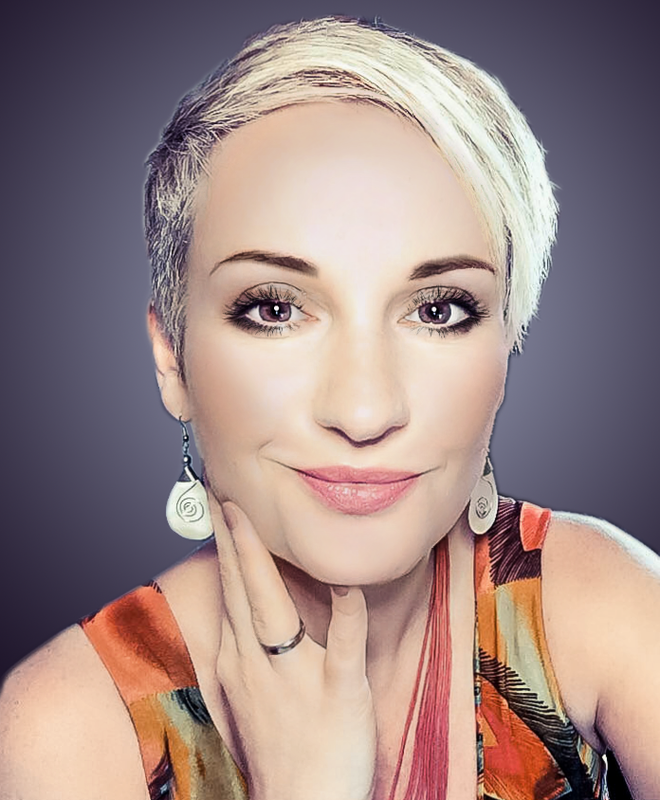 Juliette is on her mission to connect with business owners globally who are searching and ready to learn the importance of showing up authentically and fearlessly online, so they can fulfill their mission and get their voices heard. With her online and coaching programs, in-house company training and consultancy she shows them how to reach out and empower people worldwide while building the businesses and lives they truly love WITH EASE. You can connect with Juliette at juliettestapleton.com or in her Facebook group.